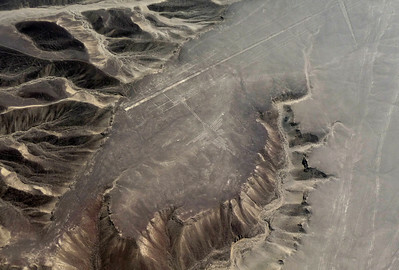 The "Nazca Lines" - enigmatic geoglyphs of the past, carved into the desert, only visible from above. 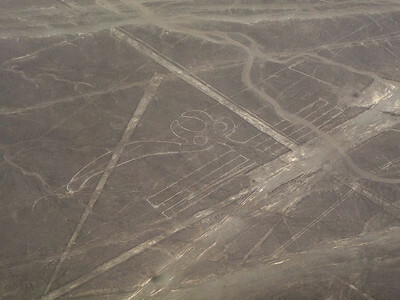 443 km south of Lima lies Nazca, a town famous for the geoglyphs etched into the floor of the red desert, only visible from above. Their meaning remains a mystery to this day, but for sure, they are fascinating. 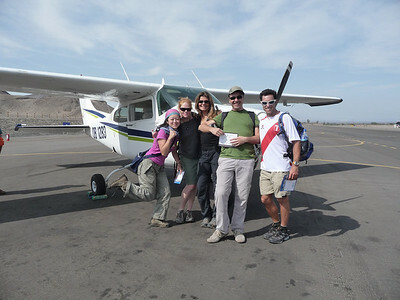 In the middle of Peru, get a load of this - we end up in a plane with 3 new friends who all speak ITALIAN and live in Italy. Including on the far left, a woman whose real name is Nosko. 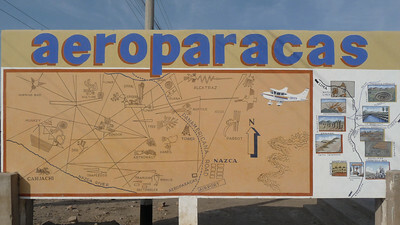 Nosko in Nazca, speaking Italian. I loved it. 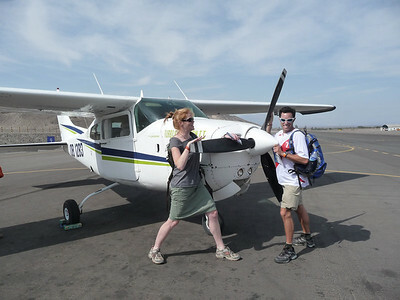 Silvia (on Lora's left) was the most sensitive to the rough flight. Allora! That's the "Owl Man", but also known as the Astronaut. 35 meters tall. Several figures of birds are believed to be attempts to reach the gods. I guess they didn't have twitter back then. This is my favorite, the "Hummingbird". Nearly 100 meters long, archealogists have dated this over 2,000 years old. 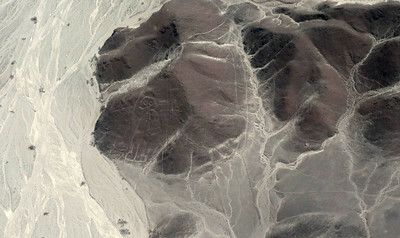 The climate lends itself to the preservation of these glyphs. Note - hummingbirds are native to the Americas, not found on any other continent. 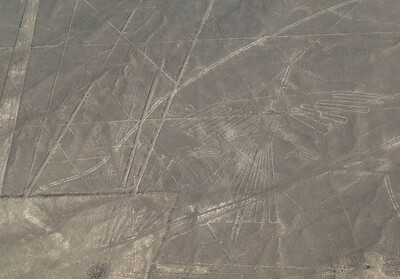 Also note, at the beak there is a group of vertical lines, up to 500 meters long, believed by some to mark a date equivalent in our calendar to be December 21st. The Condor, or Long-Tailed Mockingbird, measuring 135 x 68 meters. 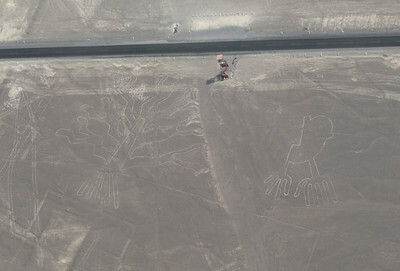 Birds and fish wee the figures most frequently drawn, because of the relationship of sea and sky in the Nazca's religious beliefs. The Parrot. There must have been hallucinagins involved, no? Finally, the Tree and Hands. Next to the road, you get an idea of perspective and how big they are. The tree is 70 meters long. The hands have 9 fingers. Don't ask. 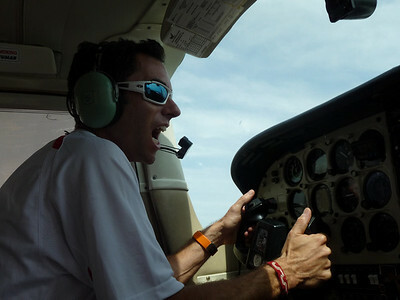 Our pilot was a rockstar. 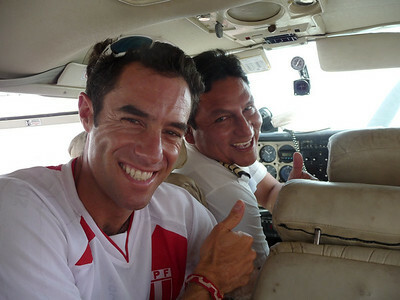 Do NOT let this guy ever fly a plane. Ever. He looks crazy.